The cichlid family is one of the largest groups of fish on the planet with over 650 species found throughout the world. Some of the most popular varieties originate from the Amazon Basin and the Great Rift Valley of Eastern Africa. Cichlids have become increasingly popular and are ideally suited as aquarium fish given a number of their traits including size and feeding requirements. The group covers a wide range of sizes and temperaments with many of the larger and Rift lake species being aggressive in nature and not suitable in general community tanks. For this reason, larger species are often kept in a ‘large species’ community tank. There are many beautiful colours displayed by this group, and it is often said that the Rift Lake species are as close as you can get to the stunning colours of marine fish in freshwater species. 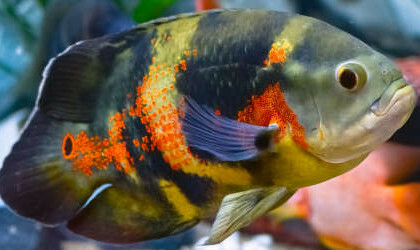 However, most cichlids do not develop their colour fully until they are adults and many are relatively dull when juvenile. Feed requirements will vary, however most Cichlids readily take a range of pellets, frozen foods and most will benefit from some vegetable matter in the diet. Remember – large species will readily eat any small fish. To learn more about caring for Cichlids please select from the following Care Sheets.